Stay at a UFO-shaped hotel, get warm in a yurt after skiing, ski at Lake Baikal and other reasons to visit Russian ski resorts. Nina Zotina/RIA NovostiThe Rosa Khutor resort in the Krasnodar Territory (1695 km from Moscow) is open to tourists all year round. From December to April there’s skiing and snowboarding, while in summer you can take a buggy up the mountain to do yoga at an altitude of 2320 meters. Rosa Khutor is not named after a flower or a woman (as might be expected), but after a local resident, Estonian Adula Roosa, who settled here with 72 other Estonian families in the late 19th century. Sergey Fadeichev/TASSThe Dombay ski resort is located at an altitude of 1650 meters in a mountain glade at the confluence of three rivers. The resort’s highest peak, Mussa-Achitara (3012 meters), offers ten pistes of varying difficulty and the chance to stay at the UFO-shaped Tarelka (Saucer) Hotel, right there on the slope. Dombay’s egalitarian runs can be combined with a day-trip to the more prestigious pistes of Krasnaya Polyana, 122 km as the crow flies (or in this case helicopter). Lev Fedoseyev/TASSJust getting to Bolshoi Vudyavr is an adventure. This ski resort is located north of the Arctic Circle at the foot of the Khibiny mountain range (1700 km from Moscow). Khibiny winters are rarely warmer than -35 C, and the snow lasts more than 250 days a year. On a clear day in April you can even ski in the light of the aurora borealis. Denis Abramov/TASSThe Cheget ski park, located in the south of the Elbrus region, welcomes skiers from November to May. Since opening in 1960, Cheget has earned a reputation for ultra-extreme skiing: tilting 45 degrees, the slopes here are off-limits to snowcats. The snow is “groomed” by skiers themselves, resulting in mounds two meters high. Those who come to conquer the untamed slopes of Cheget are rewarded with a stunning view of Russia’s highest mountain, Elbrus (5642 meters). Valery Bushukhin/TASSThe Abzakovo ski resort is located on the slopes of the Krykty-Tau ridge in the southern Urals. Stretching 2000 km along the boundary between Europe and Asia, the 600-million-year-old Ural Mountains attract UFO and paranormal enthusiasts. Because of their antiquity, the Ural Mountains at Abzakovo are no higher than 800 meters, so the skiing here is nice and gentle. Dmitry Feoktistov/TASSRussian and foreign ski-lovers are drawn to Sheregesh in the Kemerovo Region (3900 km from Moscow) for the fluffy snow that falls as early as September and the six-month season. Despite its location in central Siberia, the resort’s annual mass downhill bathing-suit run attracts hundreds of skiers and snowboarders every April. 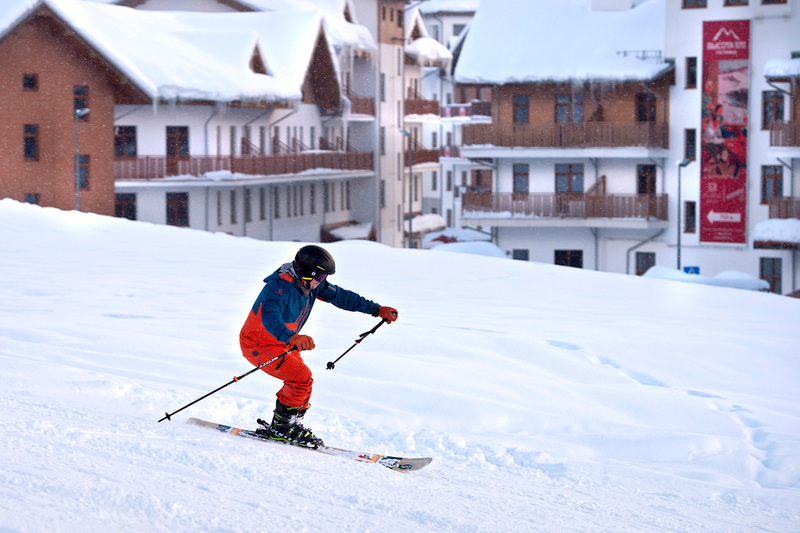 The Zavyalikha ski resort in the Chelyabinsk Region (1573 km from Moscow) at the foot of the eponymous mountain has welcomed tourists since winter 2000. The long gentle slopes with an elevation drop of 350 meters allow beginners to find their feet, while devotees can do some freeriding. There are no chairlifts, just cable cars, so your nose won’t get frostbitten in the Ural winter. The Bobrovy Log ski & fun park complex operates out of one of Siberia’s cultural centers—the million-plus city of Krasnoyarsk (3354 km from Moscow). The season lasts six months, and the drop on the slopes of the Eastern Sayan Mountains is 340 meters. The upper drop-off points offer a view of the mountain taiga and the Stolby Nature Sanctuary. After skiing you can warm up in the Tea Yurt cafe, where hot drinks brewed from Siberian herbs and berries are served. Alexey Kudenko/RIA NovostiSable Mountain rises 1004 meters above the southern shore of Lake Baikal. It is home to the Gora Sobolinaya ski resort, where the season lasts for almost seven months, from early November to early May. The quickest way to get there is by plane to Irkutsk, but the most spectacular is by train along the Baikal-Amur Mainline. Aleksandr Kondratuk/RIA NovostiThe intimate Solnechnaya Dolina is located in the city of Miass (1696 km from Moscow) in the southern Urals. The 230-meter elevation drop and gentle slopes are ideal for beginners. In addition to skiing and snowboarding, Solnechnaya Dolina offers horse-riding and husky-sledding. There is plenty to explore in and around the valley and Miass itself, including Lake Turgoyak, Chelyabinsk (the city of industrial tourism) and Zlatoust (the birthplace of Russian damask steel).